Many species of Trichoderma produce and secrete chemically diverse, bioactive secondary metabolites against various antagonistic microorganisms, including phytopathogens. Both volatile and non-volatile secondary metabolites are highly efficient for the management of phytopathogens, even under field conditions. Hence, secondary metabolites can be used as eco-friendly alternatives to their synthetic counterparts. Various secondary metabolites of Trichoderma spp. showed significant antifungal, antibacterial, antiviral, nematicidal, herbicidal, and insecticidal activity. Also, some secondary metabolites were responsible for inducing the host defense network. It found Trichoderma spp. separating into three groups. T. harzianum is best species among all Trichoderma that used it against enemies of the plant. However, secondary metabolites can be the best alternative to chemical pesticides by manufacturing the biopesticides and biofertilizer. 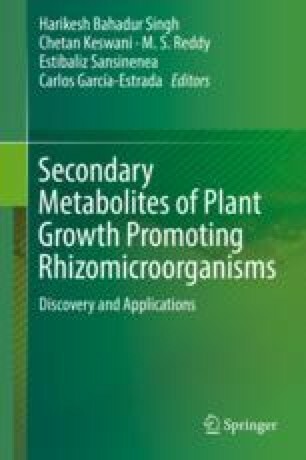 This chapter discusses the role of various secondary metabolites of Trichoderma spp. and their applications in managing crop losses.